A new voice has entered the fray in the contentious debate over the future of I-81, this time on behalf of residents who live near the viaduct and who will likely be at risk regardless of which option for the interstate’s replacement prevails. Among the questions The New York Civil Liberties Union has started asking: How will children be kept safe and healthy while spending their childhoods in the epicenter of a massive construction zone? 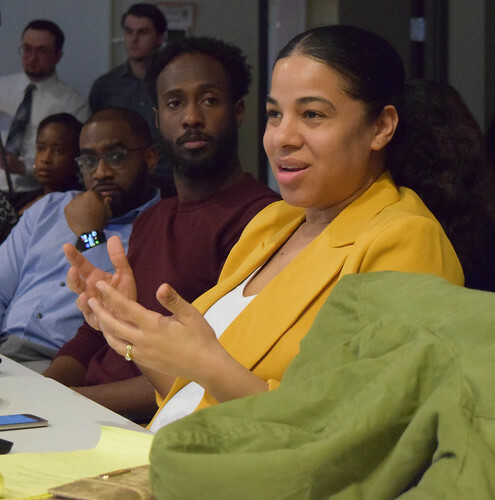 “Imagine, there will be school children who will spend their entire elementary education in a construction zone,” said Lanessa L. Chaplin, project 81 counsel for the NYCLU, to a crowd at one recent meeting. She stresses this will impact all students at Dr. King Elementary School, located at 416 E. Raynor Ave., a school with a student population of around 80 percent African-American and nearly 90 percent living below the poverty line. Portions of I-81 are deteriorating and nearing the end of their lifespan, and the 1.4-mile elevated section, or viaduct, stretching over Pioneer Homes must be updated to meet current safety standards. Three options are currently being considered: a tunnel, the community grid or rebuilding a wider viaduct. While several I-81 groups await the release of the Draft Environmental Impact Statement (DEIS), the NYCLU’s involvement is focused on protecting the residents living in the shadow of the viaduct. The group is working to determine how these families will maintain their civil liberties throughout the entire process. A key concern is how children and their families, many who’ve spent generations here, will be kept safe and healthy throughout the process or return years later after construction is complete. 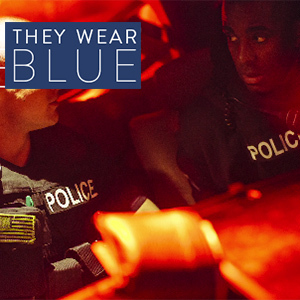 “We’re dealing with communities of color who are in the most concentrated areas of poverty who cannot get up and leave, who already have respiratory issues because they live next to a highway in the first place,” Chaplin said. The report reviewed numerous epidemiologic studies to find health disparities in such urban neighborhoods including greater rates of asthma, chronic obstructive pulmonary disease (COPD) and other respiratory symptoms; cardiovascular disease; adverse reproductive outcomes, and increased mortality. A link was found as well when looking at children and the onset of childhood asthma, non-asthma respiratory symptoms and impaired lung function. California public health law, widely considered more progressive than other states, restricts new school building construction near major highways and busy traffic corridors to ensure air quality at proposed sites. For several months, Chaplin, a native South Sider, has been at the forefront of informing the community about their rights as construction looms for whichever option is chosen. NYCLU holds no stance on a preferred option. “My role is to look out for the highway’s closest neighbors,” she said. 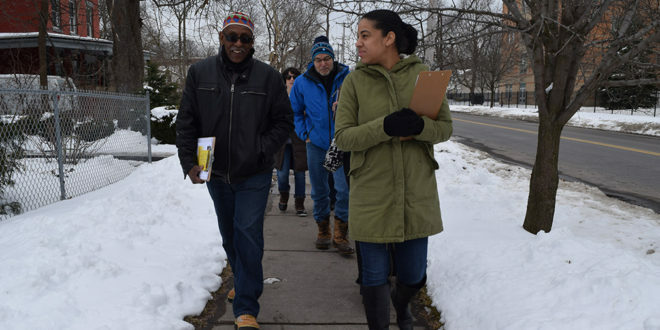 Chaplin regularly holds informational meetings to answer residents’ questions each Tuesday at Beauchamp Branch Library and spends multiple Saturdays each month knocking on doors with volunteers to get South Siders involved in the conversation. One Saturday while canvassing, she encountered a homeowner worried about whether she’ll lose her home of 40 years. Chaplin said this resident is just one of many she’s spoken to with such worries. The remainder of Chaplin’s time is spent at the office answering calls and emails, researching, writing blog posts and making flyers and infographics to hand out to residents so they can stay informed. All her efforts are in the hope of preventing a repeat from 50 years ago, when the highway’s construction decimated the 15th Ward. The existence of the I-81 viaduct has been a major driver in the issues of hyper segregation in housing and schools, says NYCLU’s Central New York Chapter Director Yusuf Abdul-Qadir. At a March 8 meeting organized by GreeningUSA, a group advocating for sustainable communities, Abdul-Qadir was one of five voices speaking on the need to delve deeper into the I-81 discussion than how the final decision will impact commutes. Barry Lentz, with Moving People Transportation Coalition, said that while this project has regional impact, consideration needs to be given to what the proportional impact will be on distant residents compared to those living below and beside the highway. Also gathered that day were: Bob Haley, of the American Institute of Architects; Joe Driscoll, chair of the Syracuse Common Council Transportation Committee, and Chaplin. 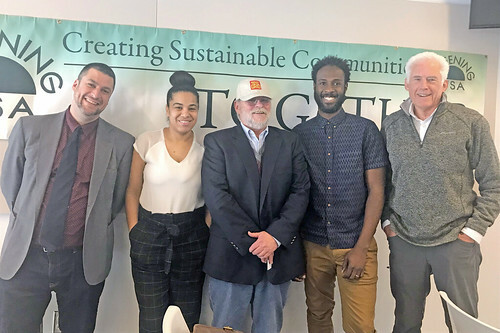 GreeningUSA held an I-81 informational meeting March 8 with panelists Joe Driscoll, chair of the Syracuse Common Council transportation committee; Lanessa Chaplin with the NYCLU; Barry Lentz with Moving People Transportation Coalition; Yusuf Abdul-Qadir, director of the Central New York chapter of the NYCLU, and Bob Haley, with the American Institute of Architects. In response, Abdul-Qadir said that what Syracuse has become known for is its label as top in the nation for concentrated poverty.